Hitting out at the interim order issued by the Court of Appeal which prevented purported Prime Minister Mahinda Rajapaksa and his government from functioning in office, President Maithripala Sirisena likened the decision to a head monk of a village temple dictating terms to the chief prelate of a chapter. “නිකායක මහානායක කෙනෙක් කරන්න ඕන වැඩක්, විහාරාධිපති කෙනෙක් දේශනා කරලා.. he said in Sinhala. By making this statement, Sirisena implied that the Court of Appeal had overstepped its boundaries when issuing an interim order against former President Mahinda Rajapaksa and his purported government. Addressing the SLFP Convention held at the Sugathadasa Indoor Stadium, a short while ago, Sirisena said there were diverse opinions about the functioning of the judiciary. “Some say the judiciary is highly independent while some allege its conduct is partial. Nevertheless, I respect the judiciary” Sirisena added. “I don’t have a personal problem with Ranil Wickremesinghe. But his politics does not suit the country. His line of thinking does not suit the country. He is divorced from our identity. He doesn’t respect our culture and traditional values,” Sirisena added. He also said he did not worship foreign embassies, hitting out at the diplomatic missions engaging with all political parties to resolve the current crisis. “I worship only people,” he added. However, Sirisena yesterday held a meeting with the Tamil National Alliance and assured that the current political crisis would be resolved in 24 hours. Sirisena has proved that he is not fit to be the President of this country. He has to be kicked out. Liar, Liar, your balls are on fire, fire. The appeals court fired your Fake PM, MaRa MaRa ChaTu MaRa AmaNa MaRa DhushaNa MaRa HoRa MaRa. The president’s powers are limited in the system of checks and balances. As the leader of the executive branch, the president ensures the enforcement of the laws in our country.. In order to limit the powers of the president, the house must approve the people chosen to fill these jobs and its expenses. Remember Judiciary is the balancing leg. bond scam report being published before calling for general election in August 2015.He had ample opportunity before this complex 19A amendment passed in the the parliament to take action.He appointed Presidential commissions only to delay in taking action. It took only 40 days for the administration led by Ranil Wickremasinghe to rob the people.It is a well known fact most politicians in Sri lanka whether they belong to Slfp or UNP or any other party is corrupt.That will not change in a while in Sri lanka. It is what you achieve during the period you are in power counts. I am guessing the SC will ask parliamnent to take a vote on dissolution, and if that fails ask parliament to follow procedure outlined by AG which decribes how to act if the President violates the constitution. Just guessing but seems like the best idea so far. The main issue is the legality of removing PM. Impossible to guess what the SC will say. They might be conservative and say the 19th was intended to prevent removal of PM. This is not what a head of a country should utter!!!!!!! Goodness gracious! Does not this President know that the LAW is above all. Yes, the parliament enact the legislation/s and it is up to the Law court to uphold the same . In a true democracy, you do not change according to your urges. 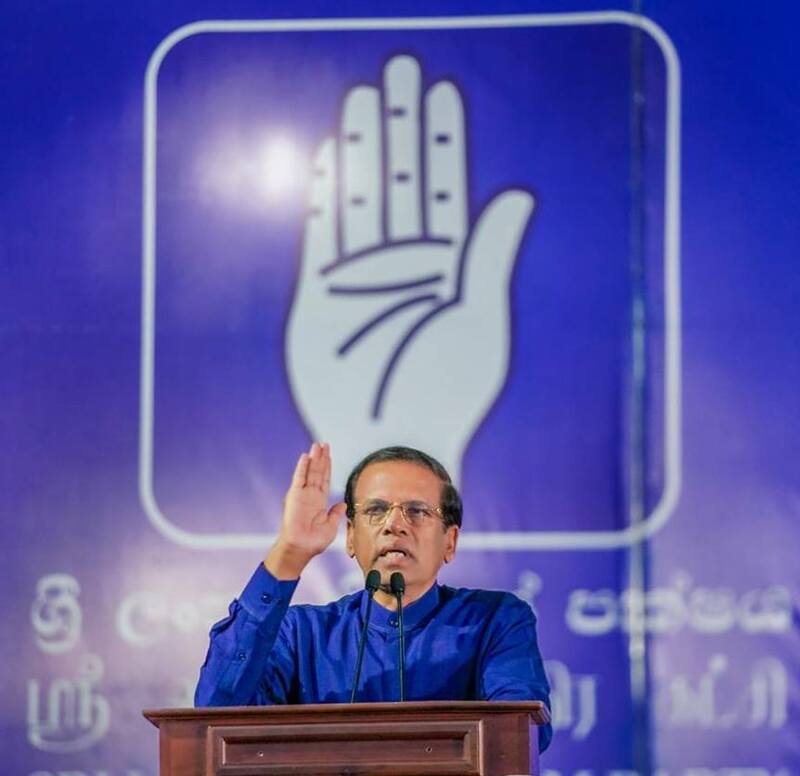 Please note the hand gesture of the President and the SLFP logo behind him. This has become quite evident in many of the meetings held by the president,even in his office!!! For goodness sake please leave the religion alone, President’s wise crack does not hold water, whether it is Nayaka Thero or Anu-nayaka Thero both will advise according to Buddhist teaching. As the President is deeply entrenched in a political cesspit he is unable to distinguish which is which. Gift of the gab is not a substitute for knowledge. Wonder if he has heard the good old saying “silence is Gold”. The Way MS is conducting himself no political party will ever propose him for a second term. Any way let’s wish him good luck.